Parking: Possiibly the most regulary packed parking lot in the vicinity. Additinoal parking at the Drinking Horse lot across the street. Campsite Availability: Possible camping on the ridge (if you're daring enough). No established sites. Trail Traffic: Moderately busy up to the start of the ridge, then traffic tends to die down. Very popular during peak season. Snow: Plenty of it along the ridge but not more than knee deep. Winter Access: Somewhat of a trail usually packed down in winter. Expect post-holing. Snowshoes recommended. Weather: Scattered snowstorms throughout day. Partly sunny. 40-50 degrees. Very windy on summit. 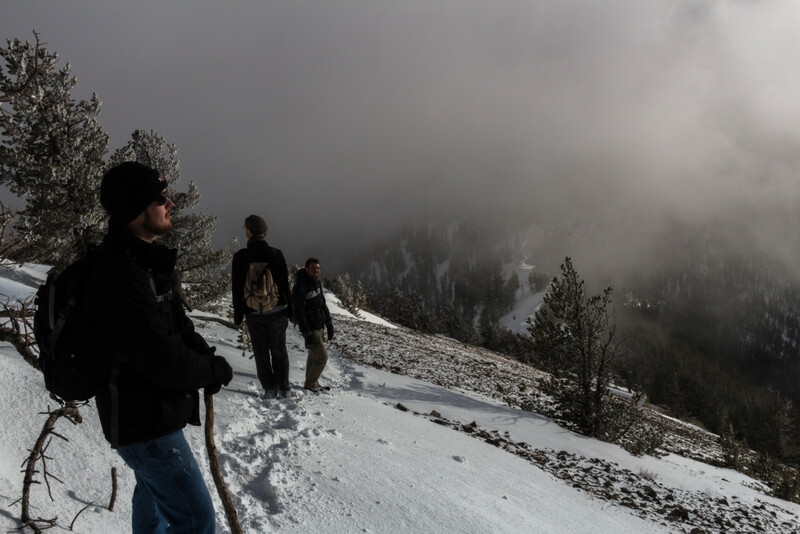 Side Quests: True summit of Baldy. 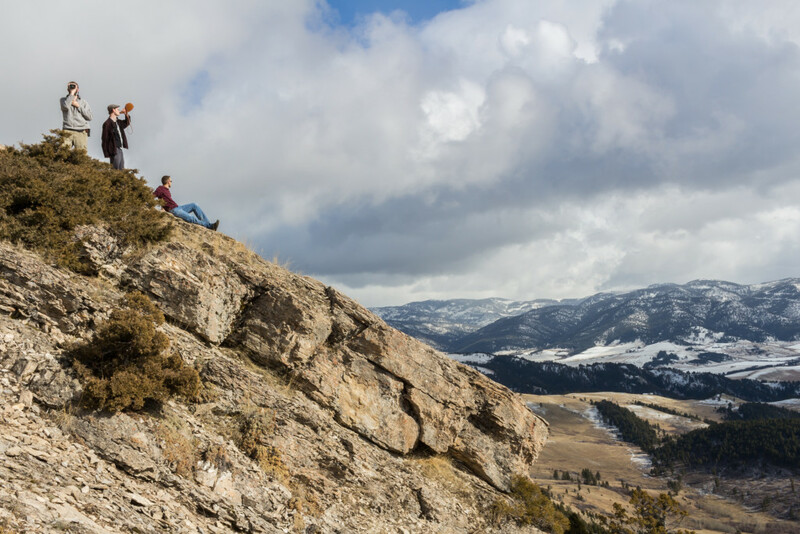 Baldy Mountain is the first high point along the Bridger Ridge and is a true icon of Bozeman. 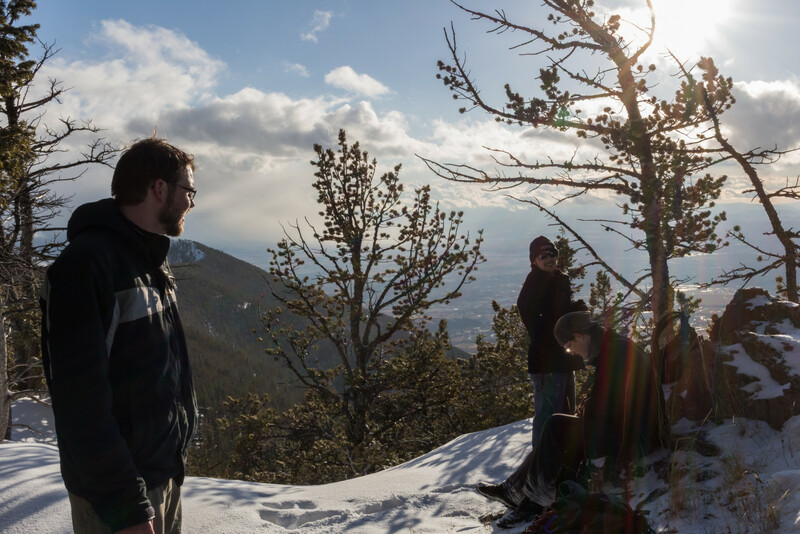 It’s easily the most popular peak to summit for locals and therefore accessible almost all year round. 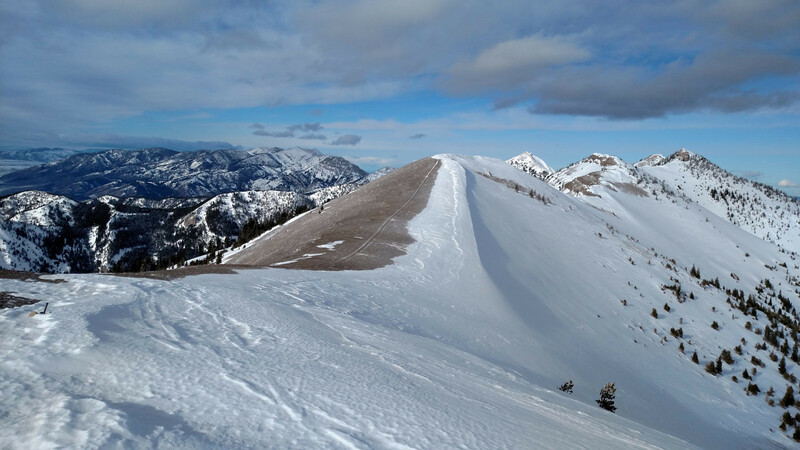 What most people don’t realize, however, is that the true summit lies about a mile beyond and 200 feet above this “false” Baldy. Nonetheless, it’s still a monster of a hike climbing 3700 ft of elevation over just 4 miles. There’re several serious uphill sections each separated by some flat as you follow the ridgeline. 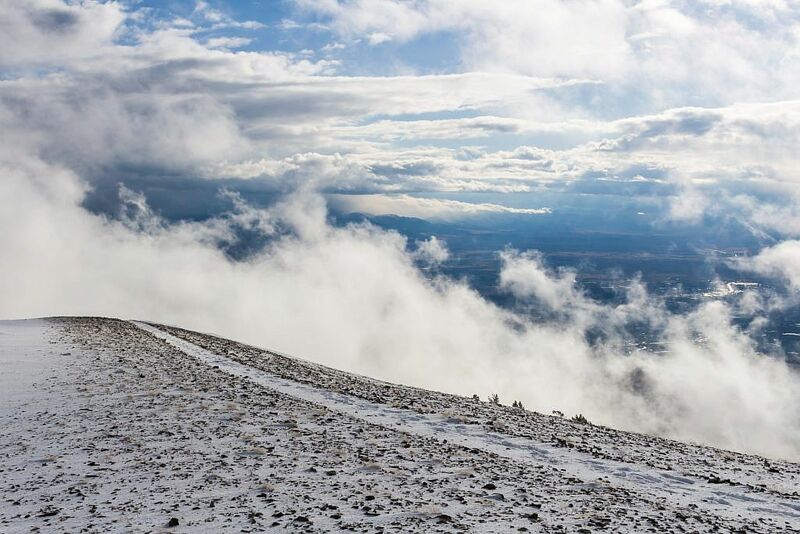 The false summit is marked by a rod and offers an incredible 360 degree view of the area. There’s also an ammo box with a log book so be sure to sign your name, especially if it’s your first time. If you’re feeling adventurous and want to hike a bit of the ridge you can proceed to the real summit about a mile ahead. Take it slow on the way down as the trail lacks good footing and can do a number on the knees. 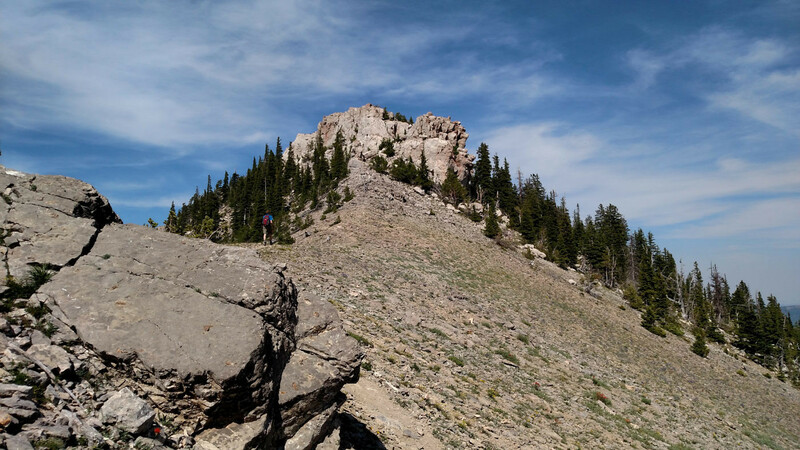 The summit can also be accessed from a different angle via Sypes Canyon. It’s a less popular alternative that’s similar in difficulty but spreads the elevation gain out more evenly throughout the hike. I’ve always been fascinated by mountains although as a young whippersnapper living in the rolling hills of Wisconsin I never had the chance to visit any. 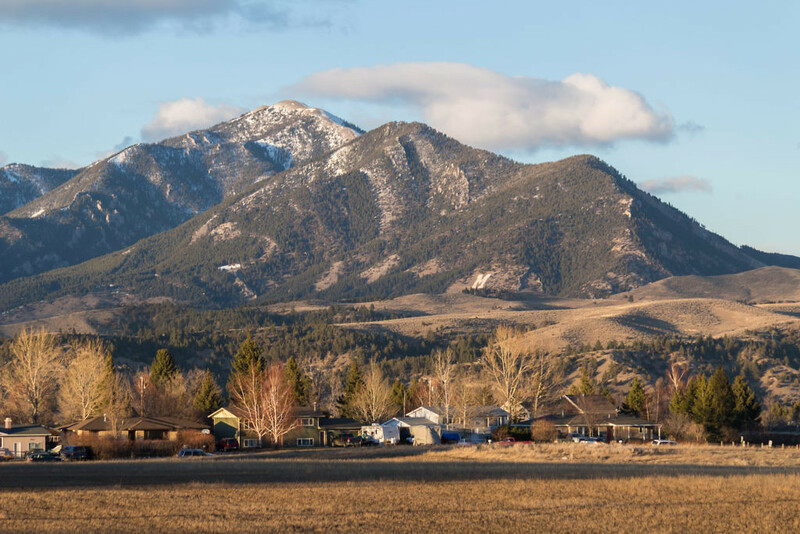 It wasn’t until a family vacation in the summer of 2000 that I laid eyes on my first mountains and from then on I knew that if I could live anywhere it would be the western United States. The West is packed with such rich geology and pristine beauty which was captivating to my naïve, 14 year-old mind. Of course, I never actually thought that in the future I’d be lucky enough live in one of the most precious places in the country; it just seemed so out of reach and unrealistic. But one day back in 2011 I opened a letter from Montana State University stating my acceptance into their physics graduate program and realized that this ridiculous dream of mine might actually become a reality. Fast forward a couple of years. 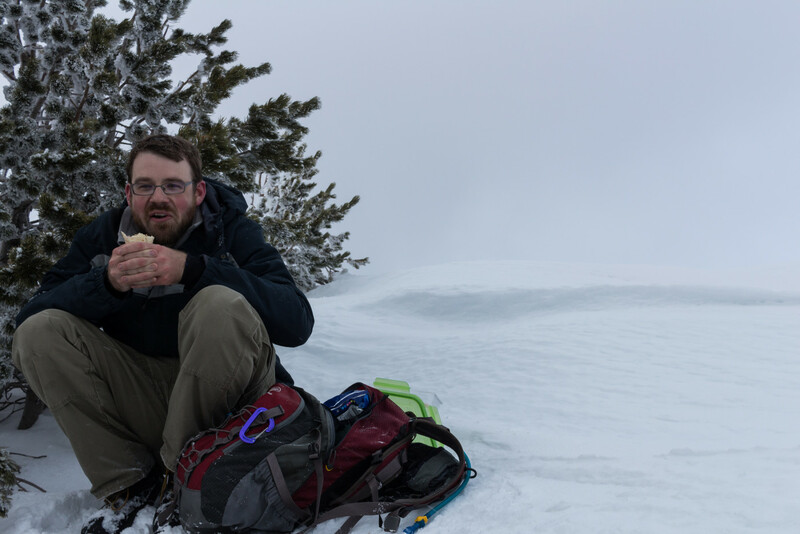 I’ve established myself as a fairly successful graduate student in the MSU physics department and seem to have my life in order, but one thing is lacking: I’d never actually climbed a real mountain despite being surrounded by hundreds. 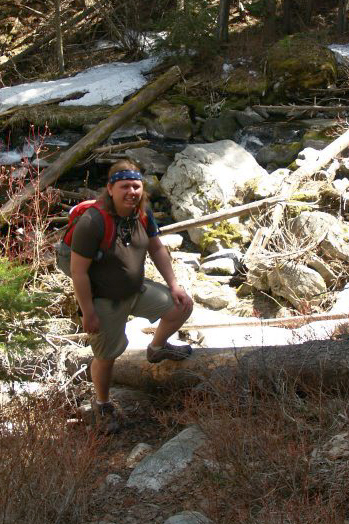 Sure I’d done plenty of hikes and smaller scale climbs but being a full-time student for so long certainly had not prepared me to scale mountains and the extra weight I’d packed on over the years was debilitating. In February of 2015 everything changed. I’d managed to shave of some significant poundage over the previous couple of years and felt fit as ever; eager to take things to the next level. 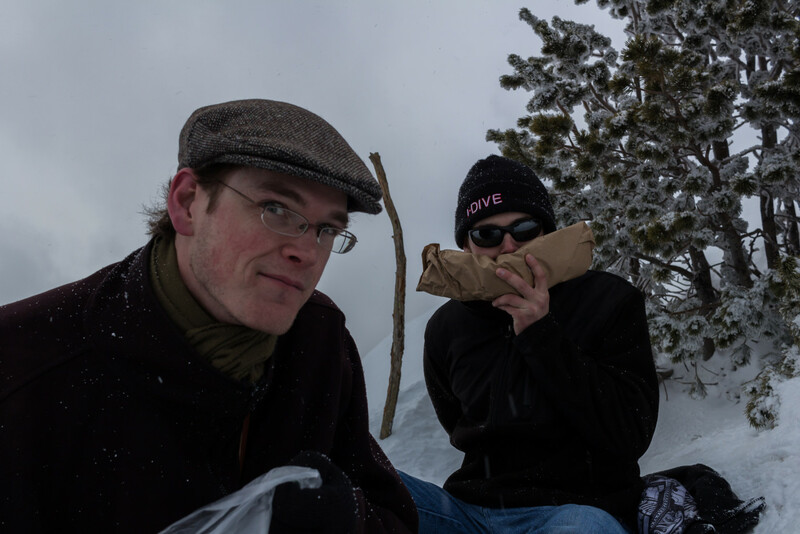 I’m not sure what prompted the idea but my friend Arlo proposed a winter climb up Baldy Mountain. A pitiful (unsuccessful) attempt the last summer left us both hungry for more so I said what the heck, let’s go for it! This is the experience that started it all. Four years later and 70 pounds less. 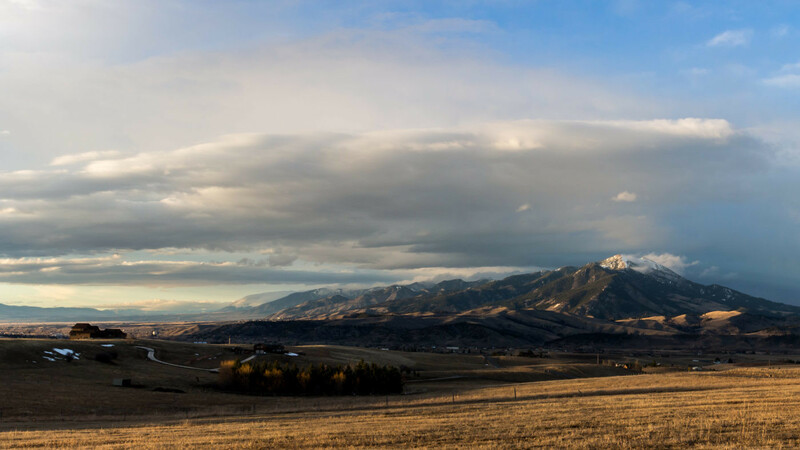 Baldy Mountain (or just “Baldy”) is the first high point along the Bridger Ridge and is a true icon of Bozeman. There are two main routes up the mountain. The most popular approach is from the south via the M trailhead. 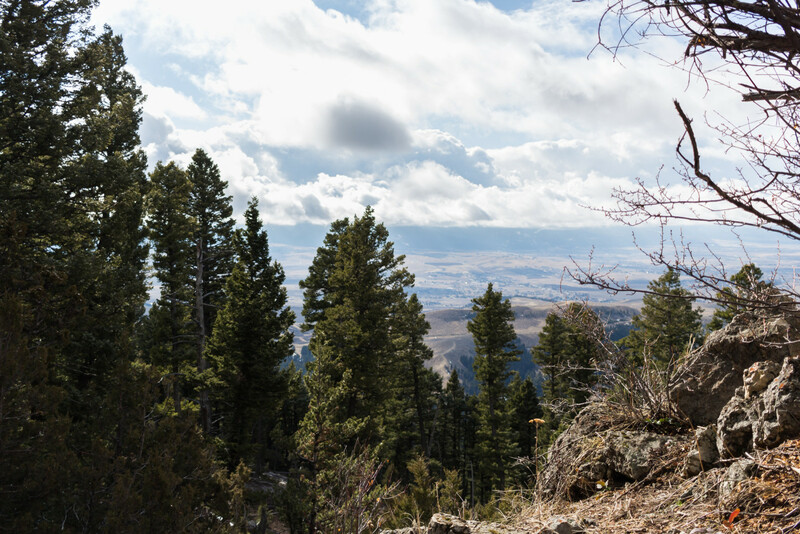 It’s a monster of a hike climbing 3700’ over just 4 miles with several serious uphill sections each separated by some flat as you follow the ridgeline up to the summit. 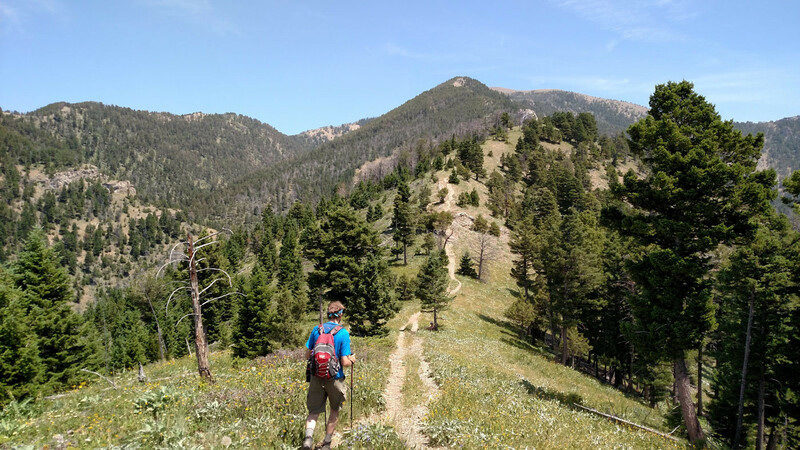 The second route is from the west via Sypes Canyon; just follow the Sypes Canyon trail until it intersects the Bridger Foothills trail and proceed straight onto an unofficial trail which leads straight up to the summit. Both routes are similar in difficulty but the Sypes Canyon approach is less busy. 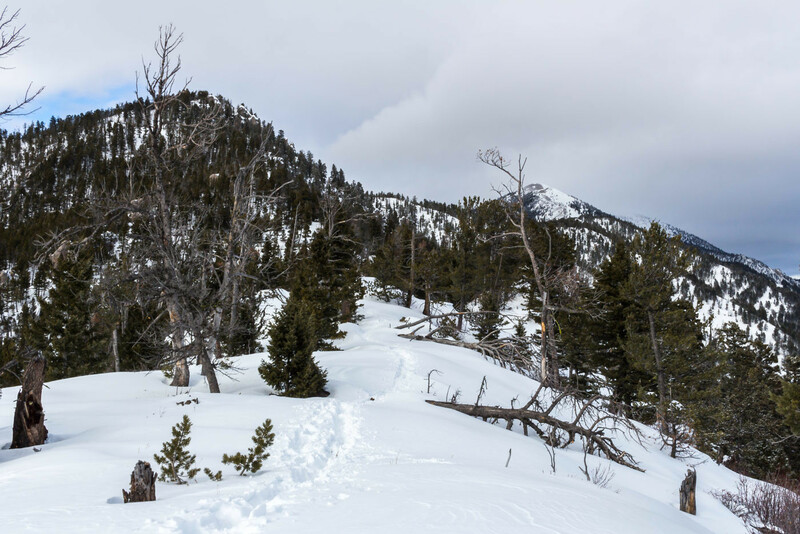 The summit is marked by a rod and has an ammo box filled with log books dating back many years so be sure to add you name to the list. What most people don’t realize is that this Baldy is not the true summit according to the maps. 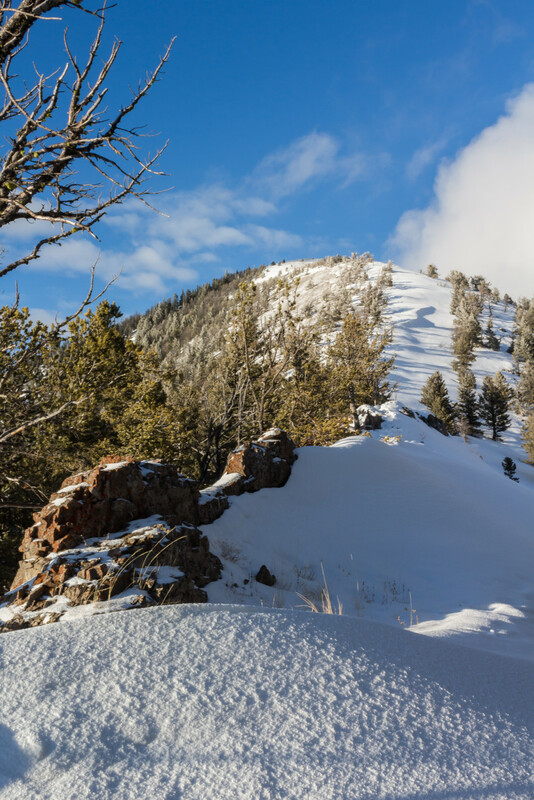 The real summit lies about a mile beyond and 200 feet above this “false” Baldy. 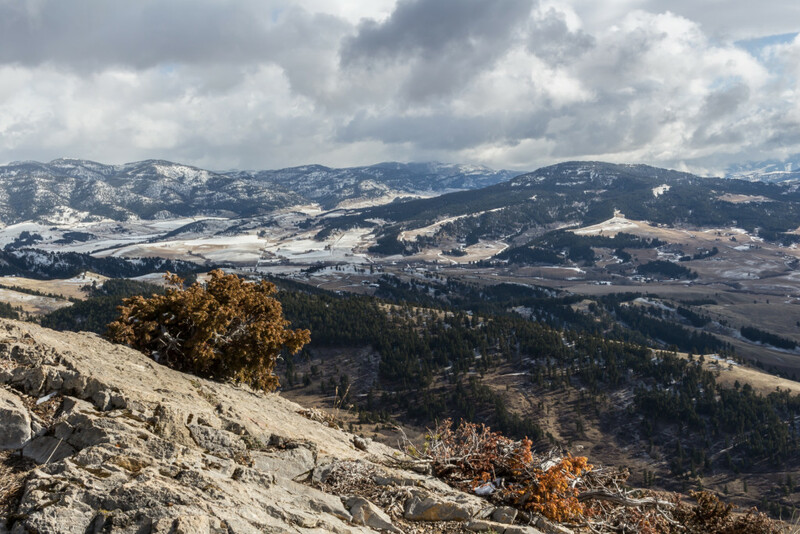 Choosing to venture to the real summit is definitely worthwhile if you have the time and want to experience a bit of the ridge but Baldy alone is challenging enough and presents incredible views of the Bozeman area. 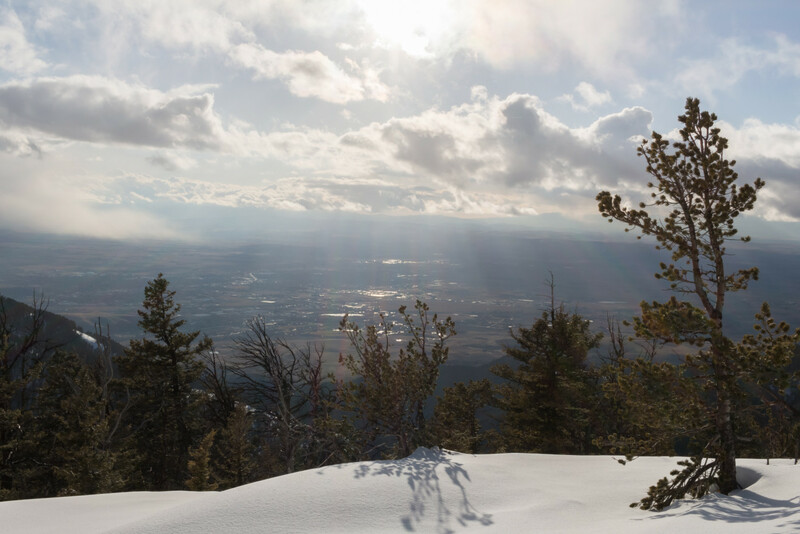 The actual summit of Baldy Mountain. Photo taken July 2015. 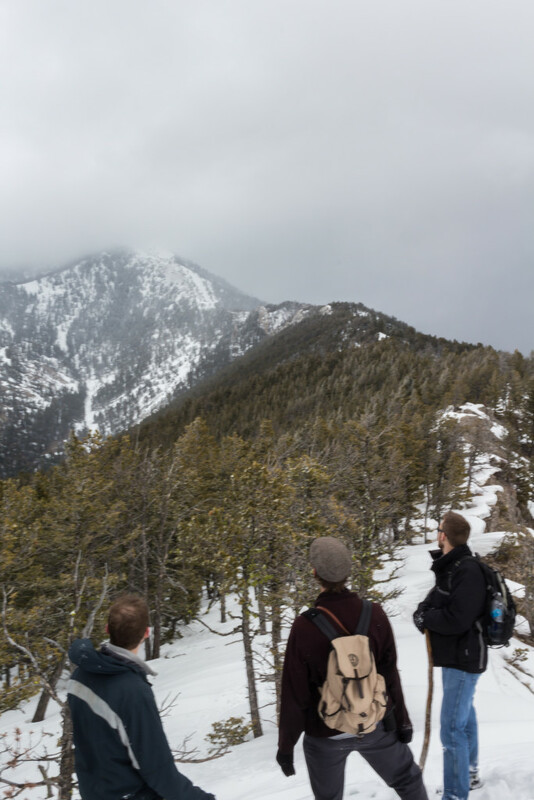 It was the day after Valentine’s Day and four of us single guys were preparing to embark on this historical hike. None of us really knew what to expect. 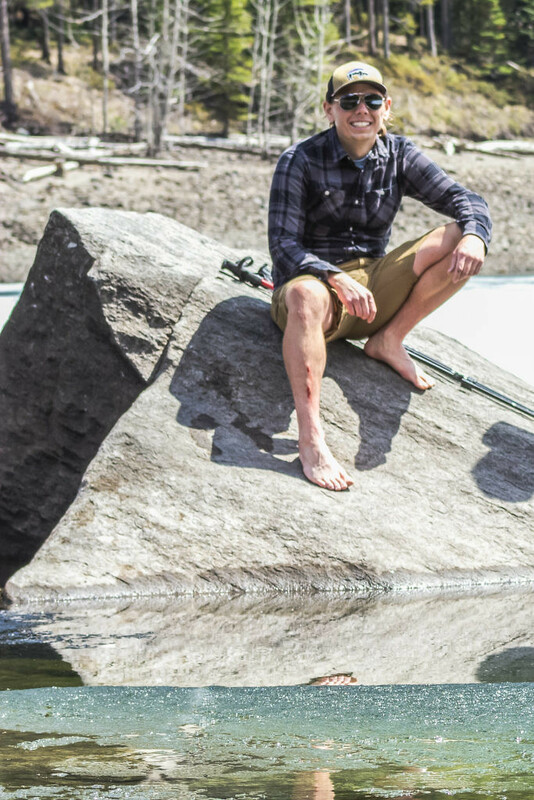 It had been a mild winter so far and much of the snow had melted but weather is extremely unpredictable at high elevations and only Arlo had any real mountain climbing experience. I made sure to pack enough cold weather clothing but it was a balmy 50 or so degrees and I was in shorts and a t-shirt for now. It’s about the simplest drive imaginable to get to the trailhead. Just head northeast out of town for about 3 miles and park at the M trailhead. The Drinking Horse Mountain lot across the street provides some overflow parking in case the M lot is full which tends to happen on weekends, especially in the summer. 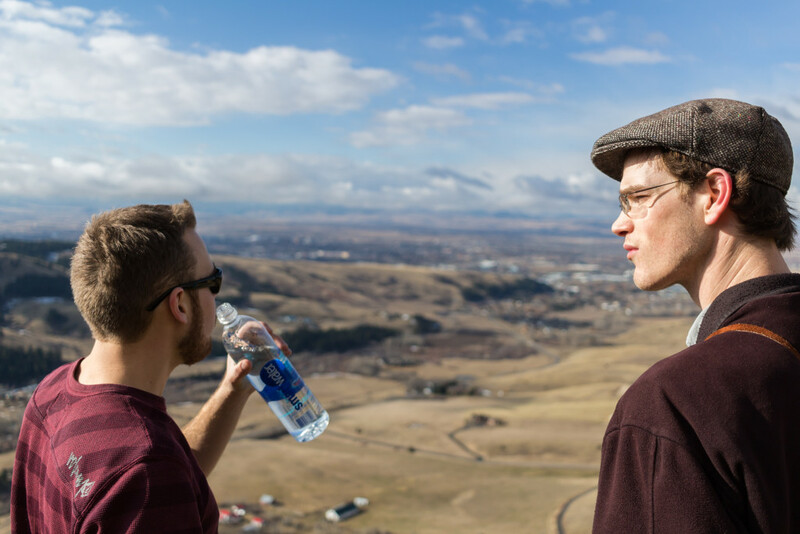 Anyone who’s hiked the M before is aware of the many routes leading there, each with varying difficulty. 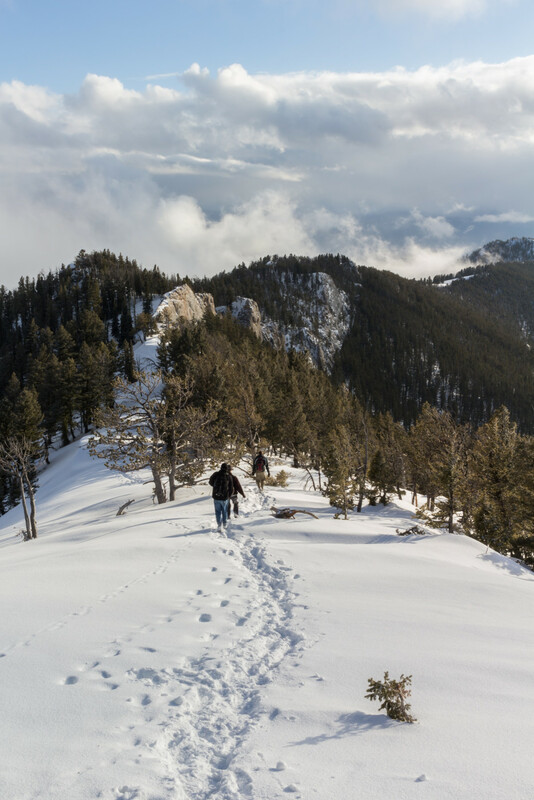 For first timers I suggest taking the moderately strenuous route since it gives your body a chance to warm up; there’ll be plenty of steep climbing later on and you don’t want to drain yourself before the hike even begins. Time is of the essence though and since the days were still short we took the steep route in order to shave off some time. Naturally, we took a quick pit stop at the M. There were already tons of people there enjoying this fabulous winter weather and the blaring sun was a promising sign that it would continue throughout the day. Quick pit stop at the M. Clearly this does not look like February in Montana. From the M it’s a very steep climb up to the ridge. The good news is that by the time you get to the top you’ve already knocked out 2000’ of the total 3700’ of elevation. 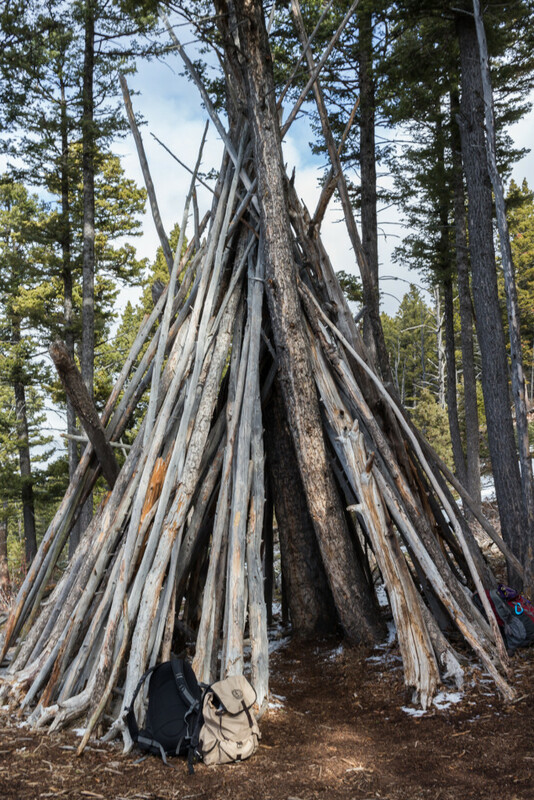 Along the way there’s a teepee which may or may not be assembled. It’s a nice little break spot and indicates that the start of the ridge is close. Making it to the top of the ridge is the first milestone of the hike. The views are great and I had to pull out my camera and snap a few pictures of the weather conditions which were rapidly changing. Ominous looking clouds were rolling in quick and I knew that we’d for sure be caught in a storm at some point. Luckily our perch from the ridge provided an excellent view of the west so we’d know well in advance when things were about to get rough. Epic shot of the guys. Looking east towards the Bangtails from the ridge. The trail continues to climb more steadily up the ridge up to a second perch. From here you can actually see Baldy, beckoning in the distance to the north. It looks far more intimidating from this angle than from the valley and it’s this view that scared us down the mountain during our first attempt. In fact, it seems like every time I get to this point on the ridge the view of Baldy makes me tremble a little bit. View from the second perch. The Knob on the left and Baldy on the right. Photo taken January 2016. 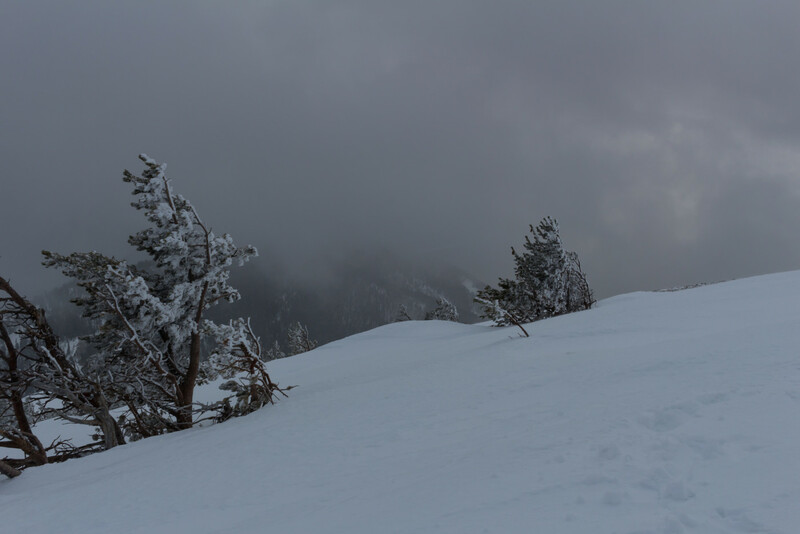 We continued onward along the now snow-covered trail towards a prominent high-point along the ridge which I shall call the “Knob”. There’s a short section of flat before a sharp climb up to the Knob which gets a bit icy during the winter. I highly suggest some sort of ice-grippers for this section but they’re not completely necessary. About halfway up the Knob there’s a neat rock just west of the trail that we scrambled up for a quick break. Dark clouds blackened the west and the first of a series of squalls that would hit throughout the day was approaching fast. 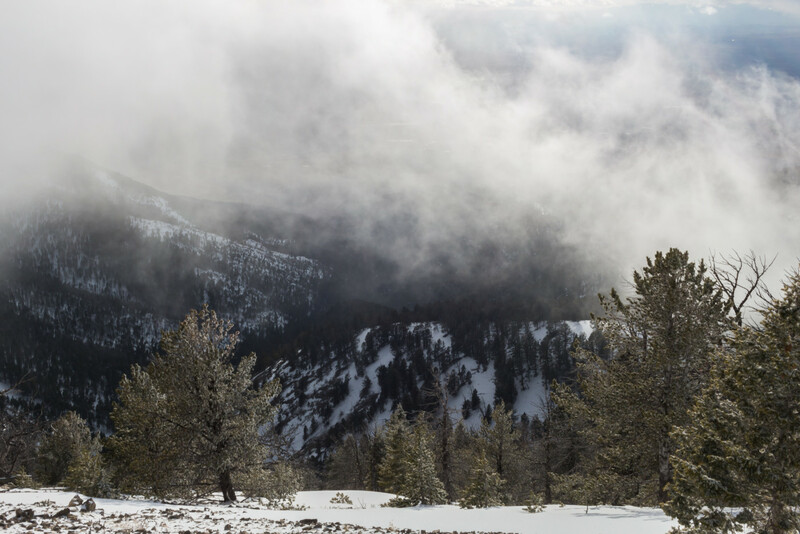 As soon as it hit we quickly darted back to our forested sanctuary and charged up to the top of the Knob where we were presented with another frightful view of Baldy. View from the rock. Storms were quickly approaching. The frightful view of Baldy from the Knob. 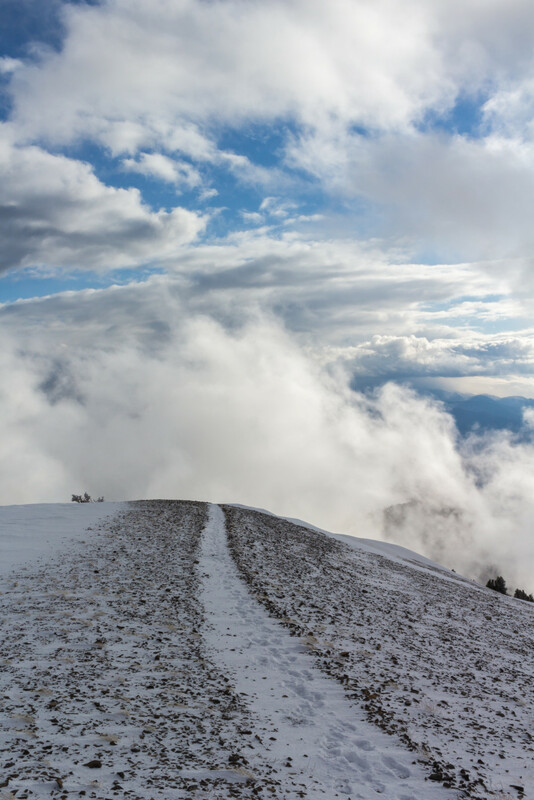 The summit is masked by clouds. One minute it would be sunny and pleasant and the next we’d all be huddled around a tree waiting for the latest squall to pass. From the top of the Knob the path to Baldy can be seen clearly. 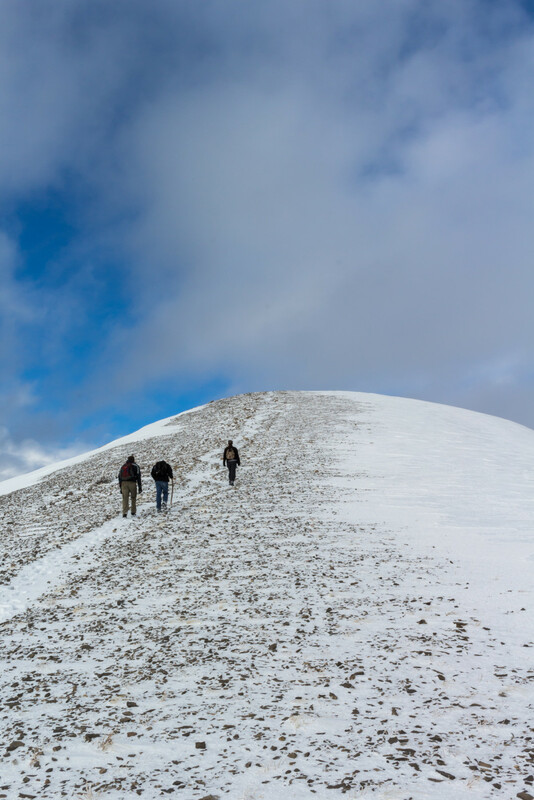 There’s a 1.5 mile long flat section which sticks to the top of the ridge followed by a strenuous climb up to the summit. The flat section is somewhat of a blur to me. One minute it would be sunny and calm and the next we’d all be huddled around a tree waiting for the latest squall to pass. It was these episodes that made our adventure an authentic and unforgettable mountain experience though and I don’t think the emotional impact would’ve been the same without them. Watch out for the cornice that builds up along the ridge during the flat section as well. If you get too close to the edge the snow could give way which would create a very undesirable situation. Finally, the end was near. 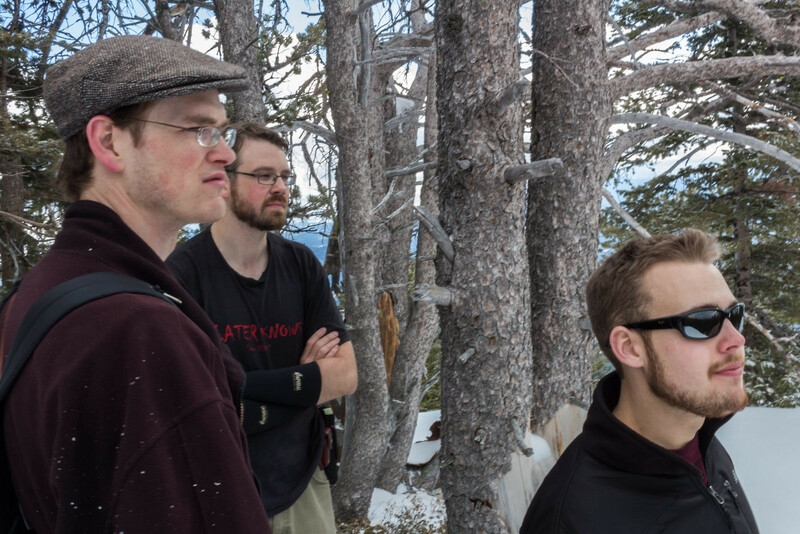 We’d managed to survive the flat section and there was about 0.5 miles and 1000’ of elevation to go so we took the chance to regroup, mentally prepare for the ascent, and reflect on life. Taking a moment to reflect before the final ascent. The final ascent is just plain brutal. It goes almost straight up aside from a handful of “switchbacks” which barely do anything to ease the pain. The storms seemed to climax during this part as well and on several occasions we had to take refuge behind some brush for quick shelter. And don’t get me started on the false summits. I swear there’s about three or four of them and if you’ve never done Baldy you might think that the trail is never going to end. But with some determination we passed the final false summit and the top was within reach. Hiding behind a bush to escape the wind. Quick shot from the final false summit. I cannot express the joy of reaching my first mountain summit. 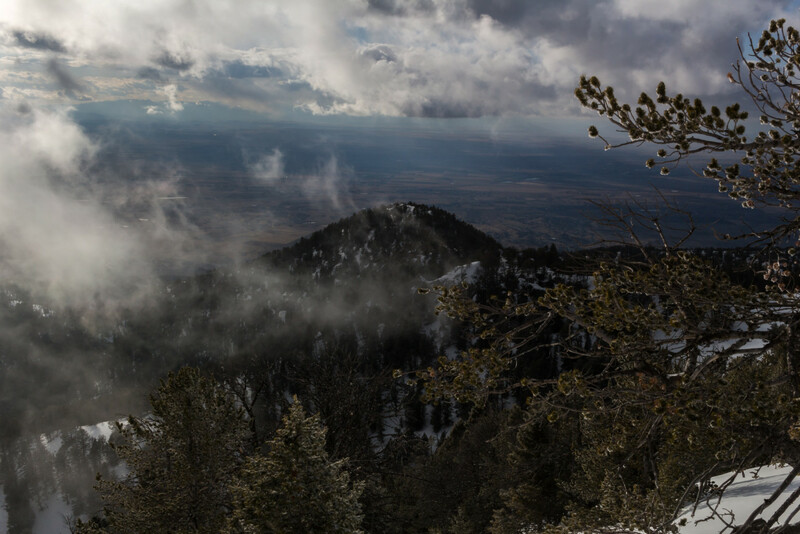 The wind was furious and the temperature was frigid but it didn’t matter, in the middle of the winter we’d climbed 3700’ of elevation through tempestuous weather and emerged victorious. Excitedly I opened the ammo box at the top to add my name to the logbooks. I hope that many years from now I’ll still be able to make the climb and view my words from that spectacular day. 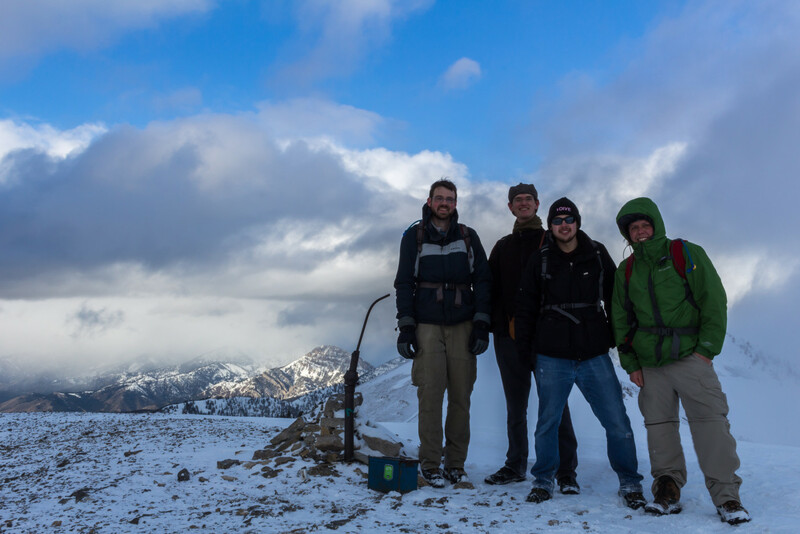 Group picture at the summit. From left to right: Arlo, Christian, Forrest, Aaron (Me). 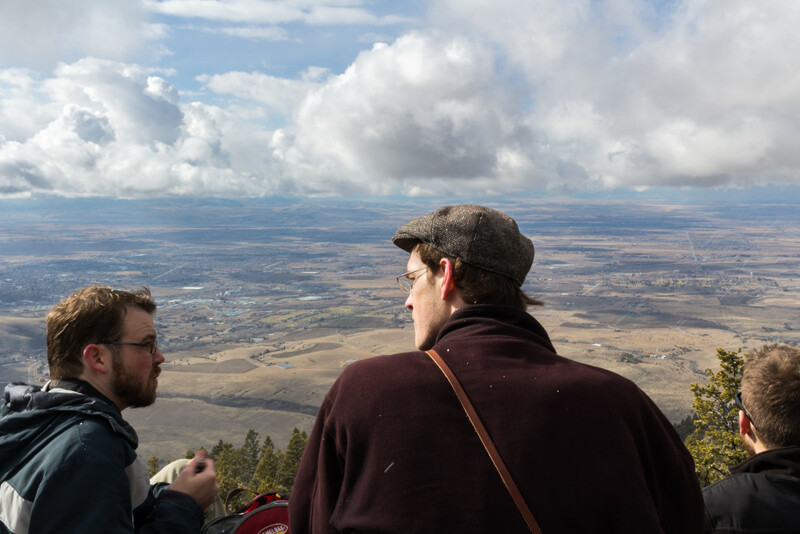 The summit presents stunning views of the Gallatin Valley and the entire Bridger Range can be seen extending to the north. The true summit of Baldy, as mentioned earlier, lies about a mile ahead. The trail continues north along the ridge for many miles and I encourage everyone to make the tiresome journey to Fairy Lake, 16 miles beyond, at least once. Looking north from the summit. 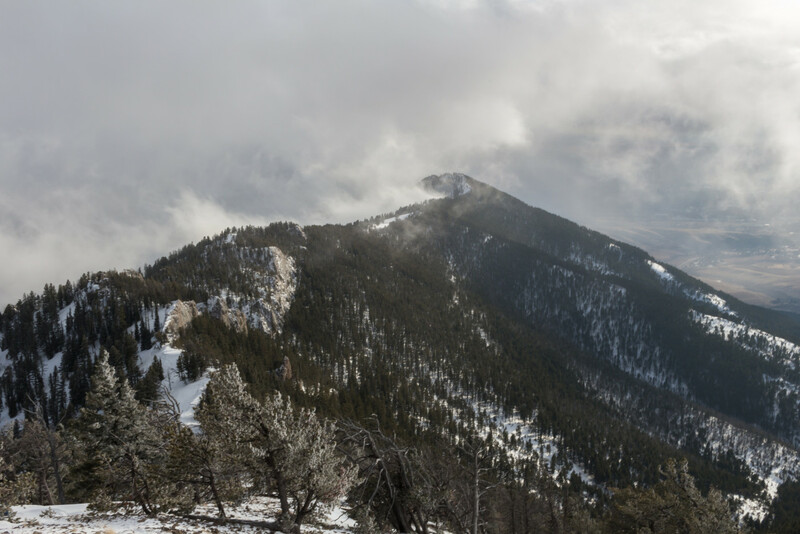 The real summit of Baldy is the peak furthest to the right. Photo taken February 2016. The journey back was just as exciting as the journey there. The storms had, for the most part, dissipated but many low-hanging clouds remained, dancing turbulently about the ridge. The return went smoothly and we started to descend the ridge just as it was getting dark. Be careful on the descent. It’s very steep and can be hard on the knees if you don’t take it slow. Despite being totally exhausted, emotions were still running strong by the time we made it back to the car. 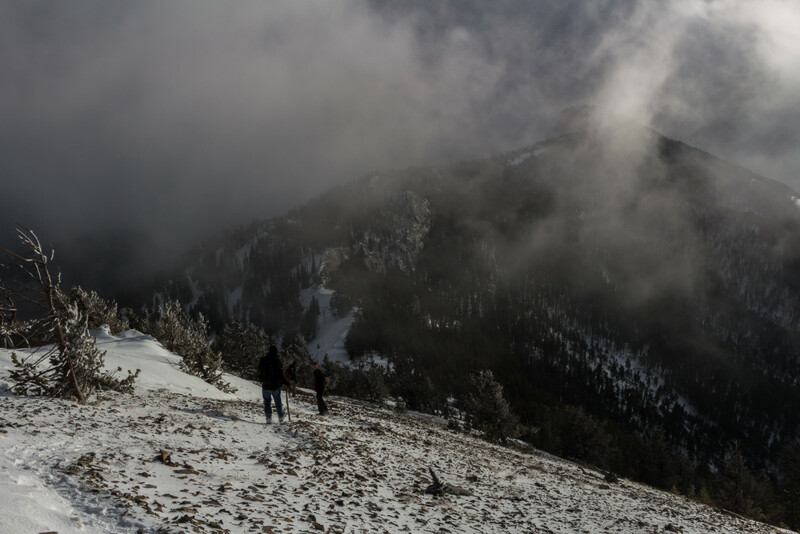 Climbing Baldy was possibly the single greatest outdoor experience I’d ever been part of and I felt a burning desire to do it again. I’ve been addicted to hiking the mountains ever since and I know these experiences will continue to be a defining part of my life here in the Last Best Place. Looking west towards Gallatin Valley. Looking south along the ridge towards the Knob (center right). You know, if you put your mind to it, you can accomplish anything.